As the fishing trade declines, rural dwellers are turning to ecotourism as a means of preserving their traditional livelihood — as well as the rapidly disappearing coconut wetlands. Pham Hoang Nam reports. Tran Thi Mai wakes up very early in the morning to prepare for a working day on which 50 tourists are expected to take trips in coracles. As the chief of the boat tour, her duty is to walk around her fishing hamlet and find enough people to help with the tourists. Mai and many other of her neighbours who are stay-at-home housewives have learned what it’s like to have an income on their own. 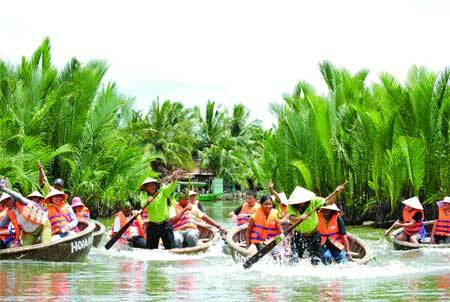 Since 2005, they have worked part-time for the Eco-Tour company in Phuoc Hai fishing village located in Cam Thanh Commune in Hoi An, an old coastal town in the central province of Quang Nam popular with foreign tourists. The company’s tours have become a hit with visitors, providing local residents with another source of income as the trade in fishing products has declined. “I set up the company with the vision of creating a sustainable business that would preserve and promote our environment and strong social and cultural values,” owner of the company, Tran Van Khoa, known as Jack Tran, said. Born in the fishing village, Khoa, who had been working in tourism, said he wanted to found a company composed entirely of local residents. He has 23 staff and six boats that can serve 1,500 – 2,000 tourists each month, along with support from local residents. His eco-tours allow tourists to learn about the daily life of fishermen, their families and community by taking a cruise on round boats on the Thu Bon River. Tourists travel with local fishermen on the river and enjoy a hands-on experience of casting fishing nets, paddling the uniquely shaped boats, taking part in boat races and exploring the tranquil water coconut (Nypa palm) bushes that flank the waterways. The Nypa palm bushes are part of the Hoi An-Cu Lao Cham Biosphere Reserve. As the most common plant seen in Cam Thanh Commune, the Nypa palm bushes form a scenic mangrove ecosystem in Hoi An, a World Heritage City. For people in Cam Thanh Commune, the water coconut wetlands provide fisheries, palm leaves and a beautiful area for tourism as well as an ideal refuge for boats during heavy storms and typhoons. However, the Nypa palm wetlands are declining in both quantity and quality. According to local residents, the Nypa palm wetlands area was substantial until the 1990s, but now only approximately 60 ha remain. The causes of the loss are attributed to an unsustainable use of Nypa’s resources, including aquaculture, leave processing and tourism. To protect Nypa palm resources, since April, the Mangroves for the Future (MFF), a partnership-based initiative promoting investment in coastal eco-systems that support sustainable development, has supported a grant project on the “Sustainable Use of Cam Thanh Nypa Palm Wetlands”. The project’s implementing agency, the Centre for Natural Resources and Environmental Studies (CRSE), has identified several key problems resulting in the degradation of Nypa palms. The US$60,000 project aims to support local communities of Cam Thanh Commune use the Nypa palm wetlands in a sustainable way and receive economic benefits at the same time. The two-year project will include activities to raise awareness of the values of the Nypa palm wetlands of stakeholders in the commune. “The Hoi An Eco-tour company’s activities help increase awareness for both local residents and tourists about the value of mangrove palms,” Nguyen Bich Hien, an MFF expert, told Viet Nam News. The project will study current ecotourism activities and propose sustainable financing for the area. “The project will also help train eco-tour guides, facilitating the partnership and agreement with the community,” Hien added. Developing, testing and operating a Nypa palm Eco-Tour programme as well as formulating a tourism strategy for Cam Thanh Commune with the participation of local community are other targets of the project. “We are very happy to join the project because we understand that sustainable development is very important,” said Chau Sang, a former taxi driver who quit his job a year ago, and now works as an official staff of the Hoi An Eco-Tour company.